S occer fandom in the United States has never been easy with weird local scheduling to keep up with Euro time zones, and other sports crowding the field. The one ray of hope has always been the World Cup. 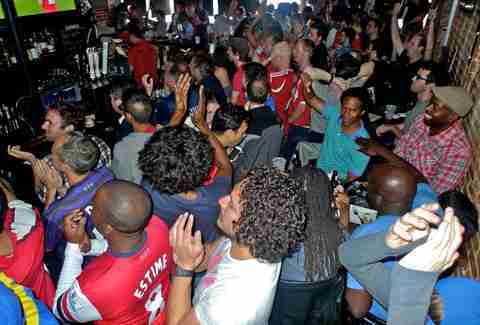 Casual observers could peek over the wall for one month every four years and root for a unified American team. It was minimal investment, the team to root for was clear, and it made engaging with soccer fun without the burden of having to learn the nuances of how English Premier League works. The US men’s national team had qualified for seven straight World Cups before they narrowly (and maddeningly) didn’t qualify this year. 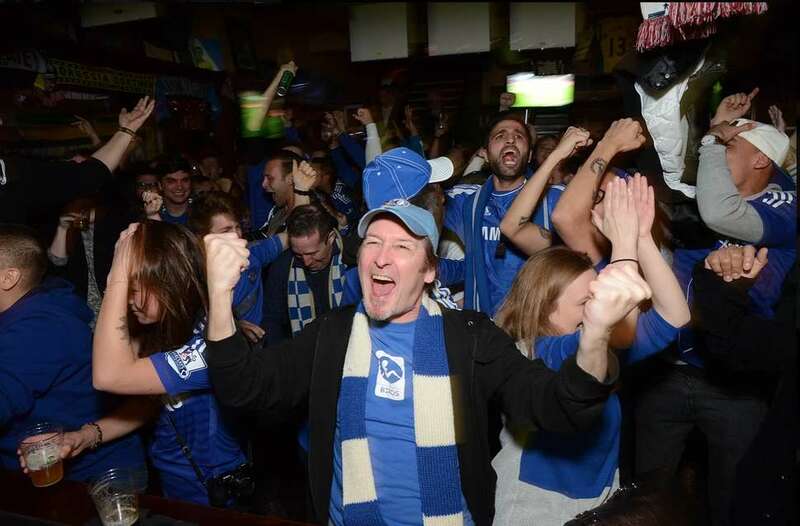 But there are still myriad nations to celebrate with, and no better place than the international mecca that is NYC to find your ideal soccer bar. We even have spots dedicated to specific countries’ fans. These are all of the best places to watch the 2018 World Cup in New York City. We’ll also update this closer to the tourney when we get more details on such vital information as drink specials. After a month of surprises, upsets, heroes, and floppers, the quadrennial World Cup comes down to France and Croatia. Francophiles can toss their berets at Bar Tabac in Brooklyn, The French Institute Alliance Française on the Upper East Side, Benoit on the west side, and Felix downtown. Croatiatiators can watch at Studio Square in Long Island City, Kafana in the East Village, or at GMT Tavern in Greenwich Village -- a British tavern with no raison d’être. 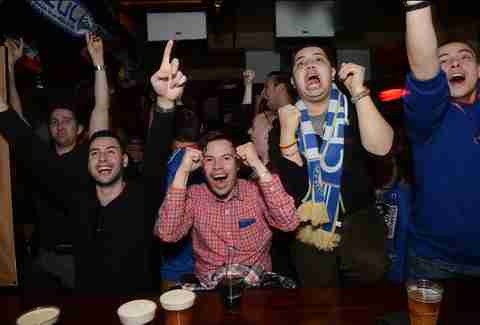 With the city’s glut of British and Irish pubs, fans of English Premier League soccer never want for options. Yet no pub does it with the same dedication as Banter. Banter Bar has been the focal point of Williamsburg’s EPL scene for years, and they throw French, German, Italian, Spanish, and other leagues in the mix, too. Fans of clubs from around the world cheer their squads here. Banter’s veritable library of whiskeys, great beers (typically with one import beer like Carlsberg on special), and food options (paninis, pretzels, sausages) make it a neighborhood bar where you can camp out long enough to actually forge a community. 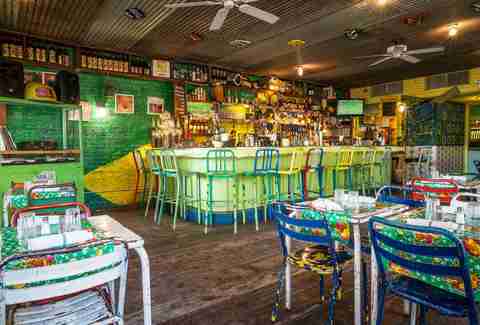 The brightly decorated, adorably adorned Miss Favela is a true slice of Brazilian culture in South Williamsburg. And if you know anything about Brazilian culture, you know how inextricable it is from futebol. This no-reservations barroom fills up quickly. Beat the crowds, and you’ll be rewarded with Brazilian dancers, live samba music, delicious food and drink options, and three screens of World Cup watching. Specials: Cash only. The opposite of a special. Sorry. Spanish for dump, Basurero’s interior flies over the low bar set by the Colombian restaurant/bar’s monkicker. But seriously, there’s a bunch of junk in here. Why not hang a tuba from the ceiling? Or go nuts with some bicycles? Throw some garland up there and you’ve got yourself a party. 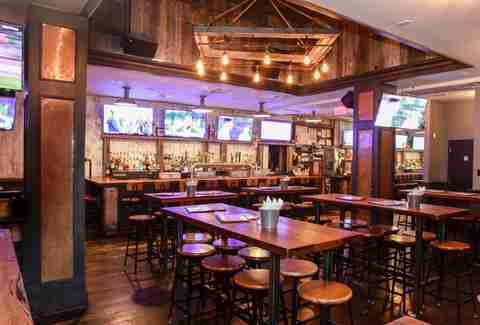 Pull up a mismatched barstool and watch the matches on a 100’’ projector screen and 19 televisions. You could have a list of where to watch soccer in NYC without Smithfield, but then half the comments would be like, “what about dmithfield’s tho?” [sic]. This is an NYC soccer institution, where Thrillist pals John Strong and Alexi Lalas from FOX Sports caught the MLS games last year. Smithfield hosts more than a dozen fan clubs from teams as disparate as the Portland Timbers and Bayern Munich. So if you’re a France fan without a home, or if you’re just looking for a madhouse experience with hordes of passionate soccer fans, Smithfield is your jam. Everybody knows that Queens is the city’s meltiest pot, and the stretch between Woodside and Jackson Heights is as diverse as any patch on the planet. Soccer being the international sport that it is, neighborhoods rich with immigrant populations will naturally cater to soccer fans. 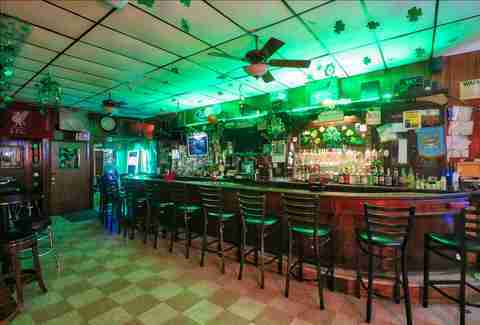 The Halfway Line is among many Woodside sports bars screening the games. They’ll be doing it with eight plasma screens and a nice little patio, should you need a breather. The big Midtown sports bars always make these lists because they’re focal points for a number of fan clubs, with space for dozens of screens to play every match. In the outer boroughs, you’ll find much more laid-back, welcoming spots suited for passionate, dedicated fans of the sport itself. Neighborhood-y Woodwork (like Banter Bar to the north) is the epicenter to the soccer community in its corner of Brooklyn. Part cultural center, part bar-restaurant, Astoria’s Circulo Español has become the de facto home for fans of the Spanish national team. Spanish transplants and lovers of their culture can root for their team among comrades while sipping sangria and dining on paella and grilled octopus, all in surroundings reminiscent of home. This is the only place where you can stick around after a match and take a dance class in the center’s grand ballroom. 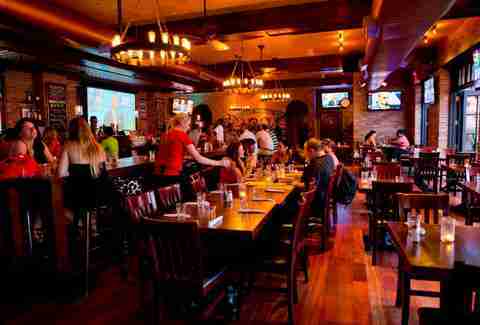 Like Smithfield, the Football Factory at Legends in Midtown East is a bona fide soccer haven. It boasts one of the largest collections of soccer memorabilia in the country; screens more than 100 matches each week from nearly a dozen leagues; and hosts more than 30 team clubs. Couple that fervency with beer and classic bar food, and you’re looking at massive, passionate crowds filing in to watch the World Cup. The Union Jack is festooned to the ceiling, an England banner hangs behind the bar, and the place has 16 different British drafts, God save the queen. ChipShop screens English footie year-round, and the scene naturally kicks up come World Cup time. “Health-conscious Americans” can order sundry fried fish options baked in white wine instead, but maybe save that for the US Open. 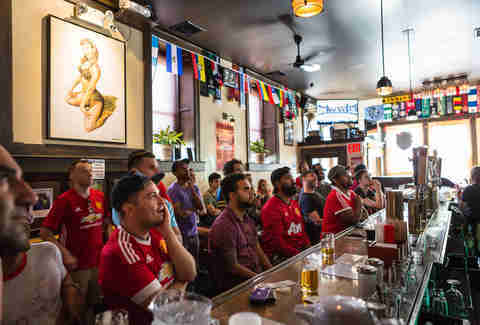 An Irish pub located in the city’s largest Chinatown on a stretch that was once a Norwegian enclave; nothing speaks to Brooklyn’s internationalism quite like The Soccer Tavern. This understated, cash-only neighborhood dive is full of years-long regulars and soccer fans from all corners of the world. Combine your watch party with a dim sum field trip: There are abundant Chinese food options nearby. Specials: $4 Domestic beer, $5 imported beer, $5 for mixed drinks during the game, maybe some free shirt giveaways? Welcoming all the fans who can fit, the DUMBO Improvement District brings the World Cup to the supersized semi-outdoor screen in the cavernous arch under the bridge for the fourth quadrennial in a row. Pack a picnic, order delivery, or hit up a nearby street vendor. Times Square is no one’s first choice as a destination, unless you’re looking for a musty 6-foot Elmo to snuggle. But old New York holdovers like Jimmy’s Corner, Margon, and BXL Cafe have long been bucking the area’s Disneyfication. BXL Cafe, in particular, has been trading in Belgian delights for nearly 15 years with its beer and food. It’s also a soccer bar and will screen the World Cup for the Midtown after-work set and homesick Belgians alike. Bushwick’s self-proclaimed “home for World Cup soccer” opens early Friday-Sunday throughout the tournament. From 10am, fans can “work from home” with all manner of margarita (grapefruit, watermelon, mezcal pineapple, lime) and tacos (vegetarian, chicken, pork, steak, fish) in a swanky, supper club-like environment with multiple projection screens and a killer sound system. There are a few Argentinian bar-restaurants in NYC (Buenos Aires in Alphabet City is especially noteworthy), but none go as over-the-top as Elmhurst’s Boca Junior. I mean, it’s literally named after a football club in Buenos Aires. Its aesthetic screams fandom: Walls are tiled with team photos and jerseys, flags hang from the ceiling, and the team’s yellow and blue are everywhere. Hinchas will feel right at home. African countries have had an interesting go at the World Cup lately, none better than Senegal’s out-of-nowhere run to the 2002 quarterfinals, a run that included a first-round win over France, the defending champs. Well, Senegal are back and looking to recapture the magic. 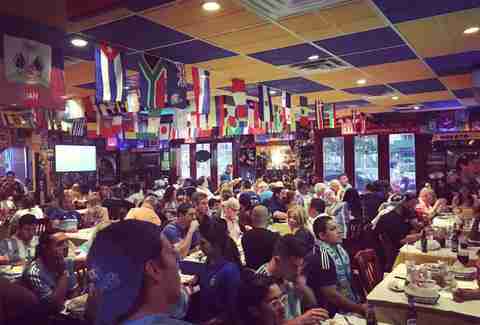 There’s no better place to root for the underdog (as well as the other African countries in the tournament including Egypt, Tunisia, Morocco, and Nigeria) than Harlem Tavern. Located in Harlem’s Little Senegal, this neighborhood staple features abundant outdoor seating, an elevated bar food, and, of course, all the matches. Named for a year that brought favor both to the world of sports (the New York Yankees) and wine (the Bordeaux region), this wacky mashup is a World Cup destination for folks who are otherwise blasé about the matches. A large but unostentatious flat screen sits flush against the mirror behind the sleek bar, and tasteful murals harken back to classic moments in sports, without shouting about them. Find out where to watch the World Cup games with all the soccer fans in your city with our list of the best World Cup bars in LA, SF, Chicago, DC, Miami, Houston and more. Erik Helin is the only Brooklyn-based freelance writer.